1. 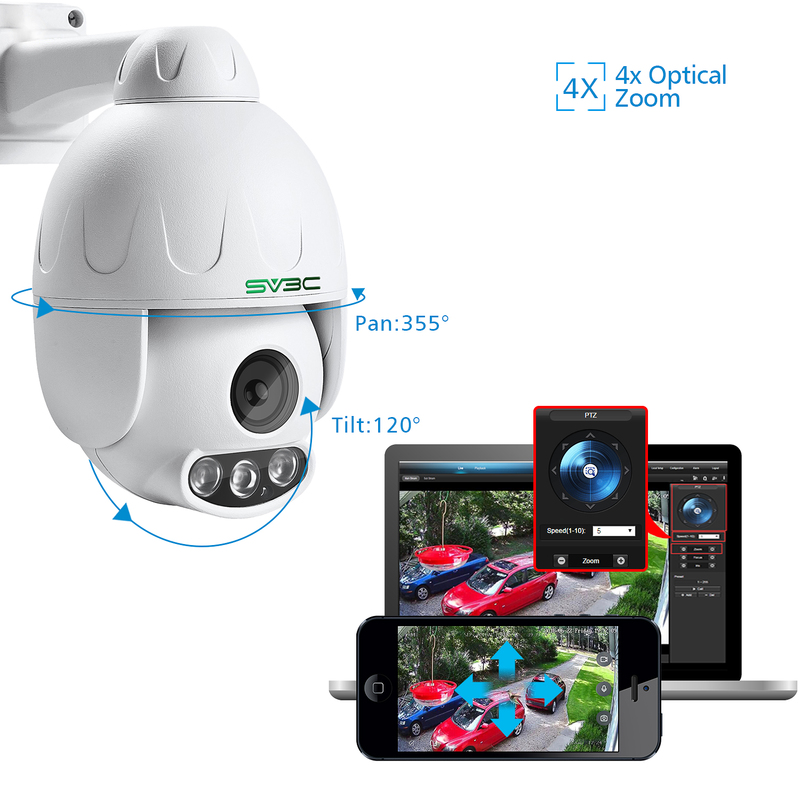 PTZ CAMERA WITH 4x OPTICAL ZOOM: with 2.8-12 mm motorized lens, 4x optical zoom captures more details of your viewing objects without image impairment when you zoom in or out. You can control the 355° horizontal and 120° vertical pan and tilt remotely via phone/tablet/PC which offers you no blind area vision. 2. SMART MOTION DETECTION: Our wifi suveillance camera keeps you be notified with push alerts on your mobile device when motion is detected. Every potential risk will be identified accurately by this surveillance camera and sent email with snapshot to you immediately. Video and image can be stored to SD card, NVR or FTP. 3. 2MP HD NIGHT VISION UP TO 50M: Sony CMOS SENSOR provide with 1920*1080P resolution offers you crystal clear image quality. Advanced night vision with 3pcs high performance infrared array LED lights extend the viewing distance to 50meters. 4. WATERPROOF CAMERA FOR OUTDOOR & ONVIF COMPATIBLE: Strong-Build aluminum case which is IP66 waterproof, suitable for any climate. You can feel free to use it for indoor and outdoor monitoring, such as room, garage and backyard etc. Compatible with Blue Iris, Ispy, Zoneminder, Security Spy, VLC or some other 3rd party software.